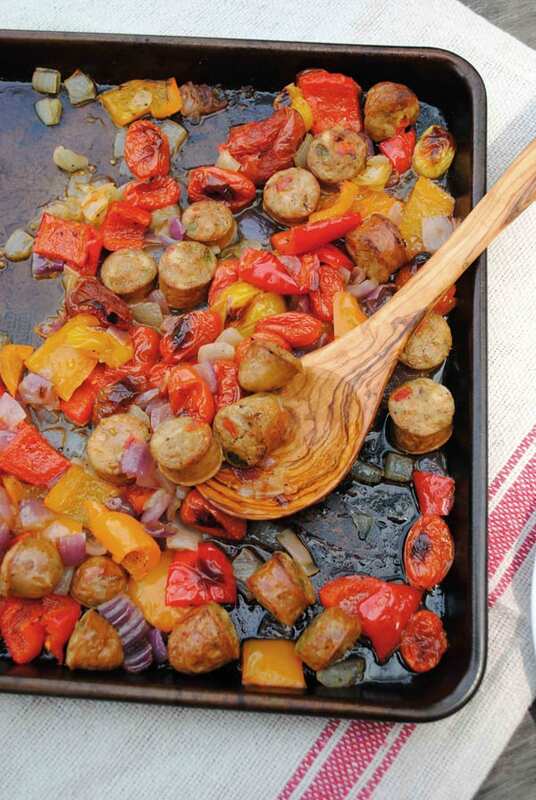 Sheet Pan Sausage and Peppers with Cheesy Polenta might be one of my very favorite soulful, yet extremely quick and easy weeknight meals. One bite and it just feels like your Mom gave you a warm hug. Honestly. It’s so comforting with the cheesy polenta underneath. And it all cooks up in thirty minutes. Visiting she always took us to breakfast and she would order grits, it’s just what you do. A lot of people on that side of my family put ketchup on their grits. I know I know. Barf. I kind of get it now, tomatoes and corn are a fantastic combo. I’m still not to the ketchup grits level, but I understand it. I grew up hating grits. Absolutely hating them. At the time I couldn’t think of a worse glue like concoction to sop up runny eggs. I always stuck with pancakes and syrup and probably stared at what my family was devouring. It wasn’t until I grew up and started making Polenta that I learned to love grits. If I go to a breakfast spot in the South I still won’t like their grits, it’s just too bland, but I do love mine. And I have converted some family members (on my Florida side) who thought they hated grits. I once caught my Aunt Janet eating my grits by the spoon in the kitchen after she claimed she hated grits. 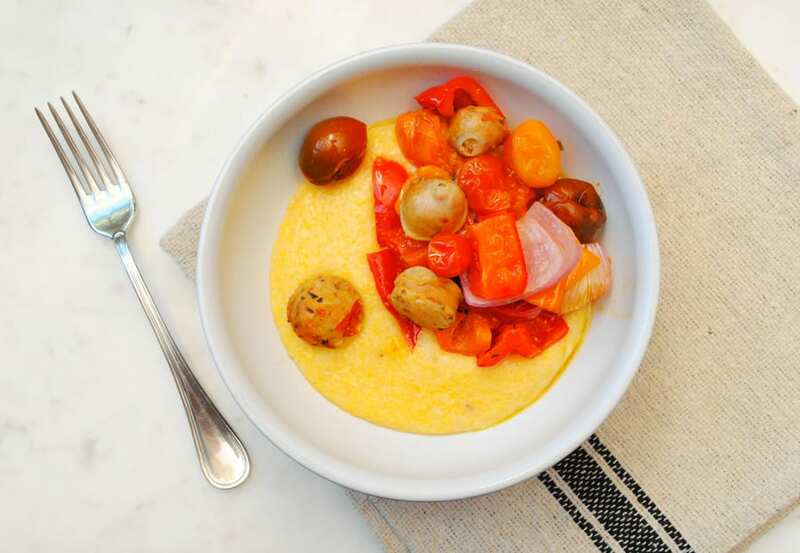 So if you fall into the hate grits category, try this Cheesy Polenta. It is absolutely delicious. 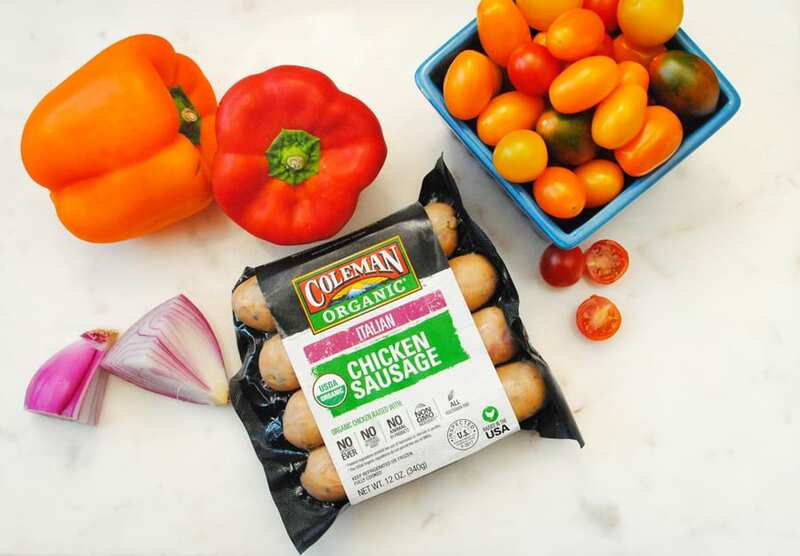 And it is the perfect thing to pair with the roasted tomatoes, onions, peppers and sausage. And if you just can’t do the Polenta then toss this with cooked pasta like penne, or cheese tortellini. But I will be sad for you to have missed out. I like to use grits from a local mill. I love yellow corn for Polenta. The color is more appetizing for me. 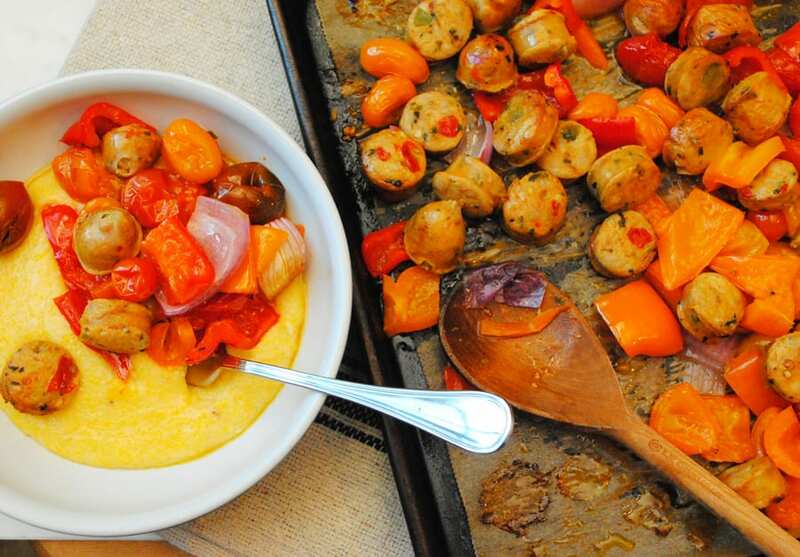 Bob’s Red Mill makes awesome polenta. Check theirs out. http://theanchoredkitchen.com/bobsredmillcornpolenta It’s at your local grocery store and usually in the health foods aisle. If you can’t find good quality corn grits then Quaker will work just fine, but do it with yellow corn. Preheat oven to 400 degrees. 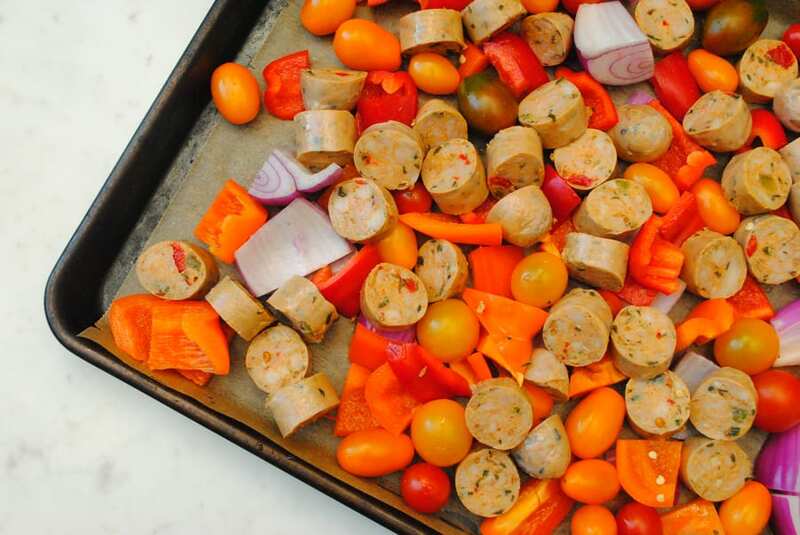 On a sheet pan combine all of the ingredients. Bake for 25 minutes, then place under the broiler for 5 minutes. Serve on top of the polenta. Bring the stock to a boil in a medium saucepan over high heat. Do this while the sausage and peppers only have ten minutes left or so. Once the stock is boiling, whisk in the polenta. Turn the heat down to medium low. Continue to stir as the mixture thickens. About 3-5 minutes. Add in the cream, salt, and red pepper. Continue to cook for an additional minute or two. Add in the butter and whisk it in until it’s fully incorporated. Pull the pan off the heat. Add in the cheese and mix it in. 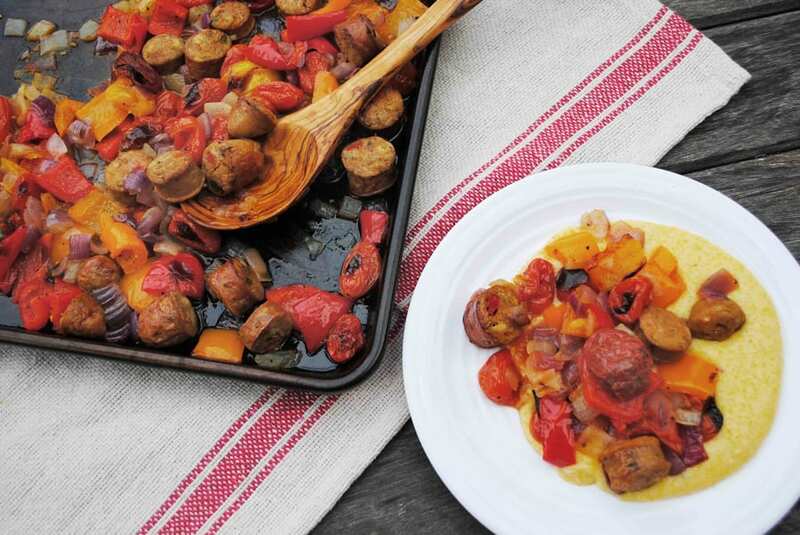 Spoon the polenta onto individual plates and then top with the sausage and peppers. This looks delicious and easy to make. I have pinned this as I plan to cook this. Awesome Meg! It's really tasty and so comforting. Let me know what you think after you've made it!